economic & social retrogression Kwara State and Kwarans had been dragged or put to by the political locusts that has wrecked and still wrecking havoc in political advancement of Kwara State and her people. Any candidate that is a product of,part or associates of the present political leadership in Kwara State in the last 12 years or more should not be voted into any of the available offices in Kwara State because they are all products of the the same system, they only fell out with each others not in public interest. Some of the candidates positing themselves now have no credible evidence of been successful entrepreneur or technocrats that had blazed trail in their chosen field. The candidates so far indicating interest made it to "centre stage" politically in Kwara State through their various infractions of public purse and conversion of Kwara State Government's property to their own through manipulations. None of them can boast or claim to have made the money they are counting on to buy the votes and the voters for the coming elections legally. Thus,they are all priding and gallivanting around with ill-gotten wealth because they had no credible business that they are known with or inheritance they can be proud of except their "success" in converting public purse to their own treasury and using same to pull the gullible ones to their sides. The task ahead for all Kwarans in 2019 is enormous if we are to regain our freedom from the kleptomaniacs that has dominated our political space. Thus,I urge all Kwarans at home and abroad to rise up and vote in credible candidates at all levels of political offices that election will be conducted into in 2019. 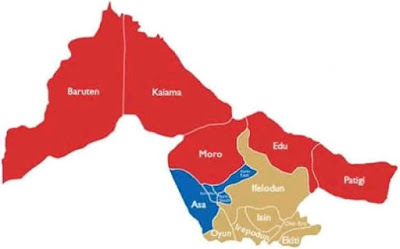 This is how we can put our State into the committee of viable State in Nigeria and proper development of the State and its people will happen not through sycophantic moves or the selfish individuals' policy of "this is how or where I can make it" that had turned most Kwarans to slaves without noticing it. For success of Kwara State and its people, there should be a halt to or enough of atenuje life style. If the Kwara State resources is properly managed for the benefit of Kwarans, the State and its inhabitants will also be developed. So arise o compatriots, to all Kwarans.